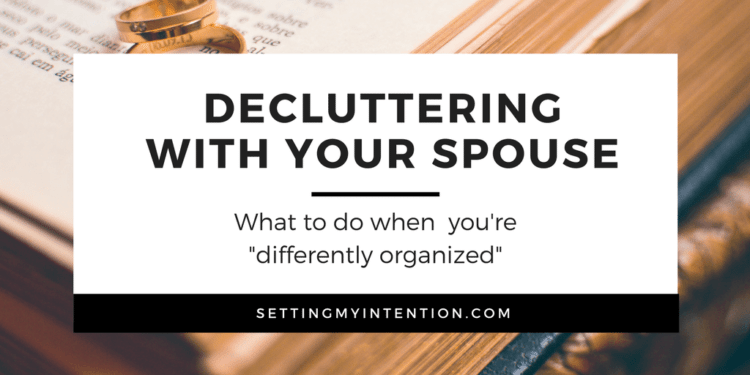 Decluttering with your Spouse: "Differently Organized?" Decluttering with your spouse can be one of the most frustrating aspects of decluttering your home. Here’s how our family has been working to collaborate in a shared space. Can I admit something? Something that may be really obvious to you? Facing clutter with your spouse or partner is hard…especially when you think it’s clutter and your spouse doesn’t. 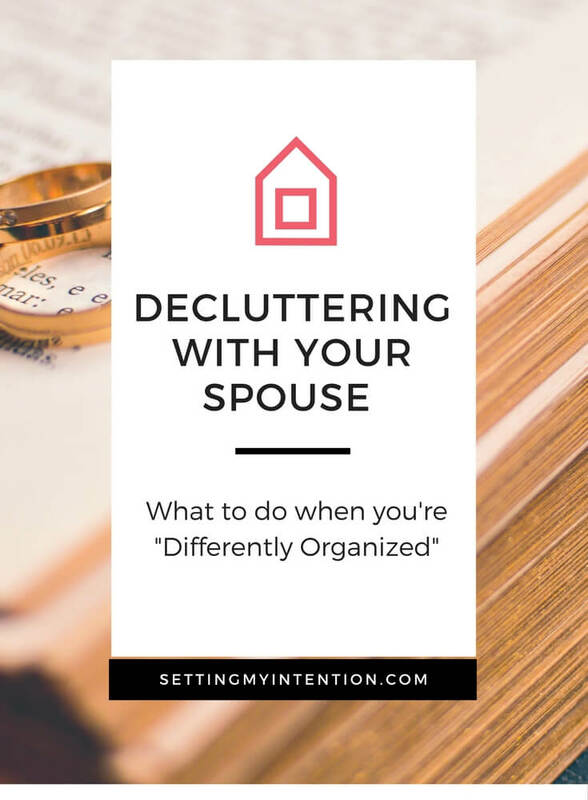 Trying to declutter and organize with someone who is differently organized in a way that is affirming of both your needs is time consuming and requires a lot of patience – from both parties. It’s easier to ignore the clutter. It’s easier to just let your loved one do their thing without getting involved. It’s easier to just stop talking about it altogether. Pick your battles right? What if you could use the “area of shame” in a way that served both of you? What if the “clutter” could bring you together? What if the “clutter” could increase your intimacy? 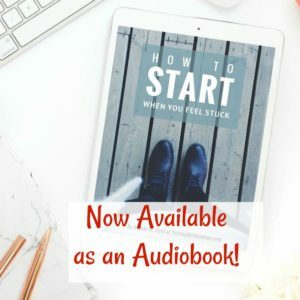 I read Organizing from the Inside Out this past month and have had some aha moments while decluttering with my husband. My husband and I have had some tense conversations these past few weeks, especially after my first Facebook Live in the basement. I started reading it after our tense conversations and she affirmed what my husband already tried explaining to me – his way of keeping his stuff is not going to look how I want it to look. The way I want the basement to look, is not going to work for him. The way he wants to use the basement, is not going to work for me. My husband is more than willing to plan the space around our family’s needs, so it’s just a matter of us coming up with a strategy that works for all of us. Initially we thought about splitting the basement in half and we would each be able to have “dominion” over our half of the space. That might work, but after talking some more, we realized that that solution wasn’t the best solution. It didn’t foster communication or compromise. I’m actually not sure how we’re going to have all of those activities happening at once down there (it’s a large space – but not that large! ), but we’re going to figure it out together. Asking each other questions, asking ourselves questions, and patiently listening with the intention to grow in our understanding of how the other works. Will it be hard? Definitely. Will it be worth it? Undoubtedly. Do you have a loved one that is “differently organized” than you? 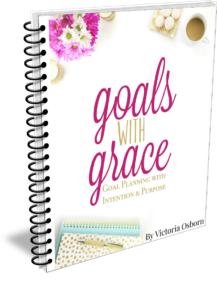 Are you willing and ready to have a conversation about your frustrations and hopes? Let me know in the comments! “differently organized.”- Thank you!! Now I finally have a name for what ailed me, and 2 of my former husbands! It’s a helpful term isn’t it? She says that as long as 1. the person can find everything they need when they need it and 2. if they are comfortable in the space then the person is not disorganized, but differently organized. What a great post! (Over the Moon! )…my hubby has hoarding tendencies, so I have to catch him in the right frame of mind for decluttering. It’s a process! Thanks so much for sharing at #Over the Moon. We look forward to seeing what you’ll share with us next week. Yes, my husband and I are definitely ‘differently organized.’ I have to keep his office door shut because it just drives me completely nuts. But it’s his space. I probably exert too much control over our shared spaces, though, so thank you for the reminder to work together instead. Thank you for sharing so honestly, Angela! I’m not sure my husband and I are differently organized, but we do struggle with clutter. Your hints will help us too, even though we are both working towards a similar goal. Thank you so much for sharing this valuable post with us at the Hearth and Soul Link Party. Pinning and sharing. Hope you are having a lovely weekend. Thank you April. That’s awesome that you and your husband are working together towards your goal! This describes my hubby and I to a tee! Congrats – you’re one of our featured guests at Inspire Me Monday at Create With Joy!